Steve Schofield is a photographer. His practice explores the fascination that the British public has with American popular culture and the sub-cultural world of fandom. 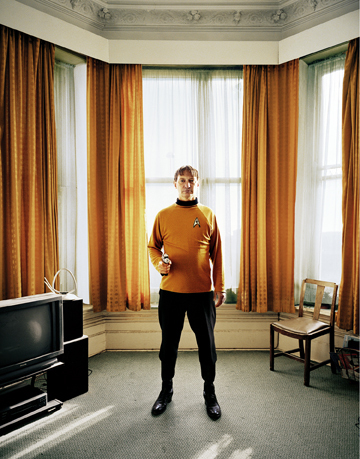 In his growing photographic series Land of the Free, Schofield shows people in their own homes wearing costumes they would dress in to attend events and conventions with other like-minded people. The work offers a glimpse into seemingly ordinary lives and allows the private to become public. The work hints at the depths of people’s fantasies and the methods they employ to adopt this culture as part of their own lifestyle as a means of escapism. Although there is a lot of humour in Schofield’s work, he is also making a strong political reference to globalisation and America’s ongoing ability to infiltrate all cultures via various channels of media. There is a certain amount of vulnerability and discomfort that radiates from the sitters which is acutely conveyed to viewers of the images. Often presented in full costumes, the sitters seem at odds with their surroundings; two Klingons sat on a sofa, Darth Vader standing in his living room and Chewbacca leaning on a kitchen worktop. Schofield’s work is intended to encourage the viewer to question the perception that others have of themselves as much as they allow us to question our perception of others.